ASTC Making & Tinkering Spaces in Museums Community of Practice (CoP). Each of these three workshops has been carefully planned to introduce participants to specific aspects of planning, designing, operating, refining, and evaluating public programs and spaces for engaging audiences with making and tinkering. Sign up for one—or all of them!—soon and start building your inventory of practical knowledge and a supportive network of peers engaged in similar activities. Contact ASTC’s Wendy Hancock for more information about the series or individual workshops. Exhibits and programs related to making and tinkering are now important aspects of many science centers’ offerings, for good reason. Tinkering is an engaging, fun, valuable means of doing what scientists and engineers do. How can we move our tinkering and making programming and thinking to the next level? Join colleagues for a deep dive into different program models for engaging learners of all ages in engineering and problem solving through tinkering. 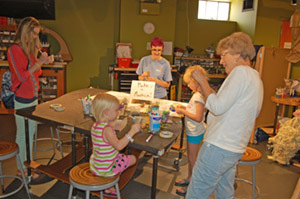 This workshop was held at the Montshire Museum of Science, a regional science center on the banks of the Connecticut River in Norwich, Vermont. Sessions included developing criteria for strong making and tinkering programs that fit your unique institution, designing collaborative learning environments, understanding strengths and challenges of different program models, sharing and practicing simple evaluation instruments, and opportunities to extend the learning through kits and outreach. The event was led by these ASTC Making & Tinkering Spaces in Museums CoP Members: Lisa Brahms, director of learning and research; Greg DeFrancis, associate director and director of education, Montshire Museum of Science; Rachel Donegan, science educator and program manager, Montshire Museum of Science; Bob Raiselis, associate director and director of exhibits, Montshire Museum of Science; and Sherlock Terry, assistant director of exhibits, Montshire Museum of Science. This workshop introduced participants to the Discovery Network, a statewide consortium of both informal and formal education institutions aimed at igniting a passion for science, technology, engineering, and math (STEM) education through inquiry-based learning. 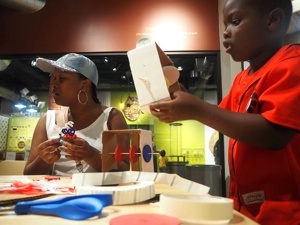 Through membership fees and other revenue streams, the Museum of Discovery serves as a hub supporting other like-minded learning organizations in providing maker education. Services include staff capacity building, a library of mobile making/tinkering kits, and support for Tinkerfest, a makingpalooza that engages thousands in STEM activities and skills. Team members from 10 institutions gained an understanding of this fee-based membership model, explored with some of the maker education kits, discovered how teaching methods are adapted for different stakeholders (including history museums, libraries, schools, and early childhood facilities), and learned how the Discovery Network increased membership by 200% in just 12 months. The event was led by these ASTC Making & Tinkering Spaces in Museums CoP Members from the Arkansas Discovery Network: Kathleen Lawson, director, and Brittney Kugler, professional learning specialist. This two-day workshop will serve as a great introduction to any informal or formal educator interested in starting his or her own tinkering space. Don’t just read a case study—walk through an innovative making environment with the people who developed, opened, and reengineered it! Find out about the successes and failures experienced when Imagination Station opened the Idea Lab in May 2016—with particular emphasis on navigating budget challenges—and get do some making and tinkering yourself in the space. The event will also delve into how a new tinkering space (and the philosophy that embodies it) has the potential to support and amplify other institutional functions, including teacher professional development, special events, and programming outside the organization’s facility. Click here to register for Tinkering with a Making Space. 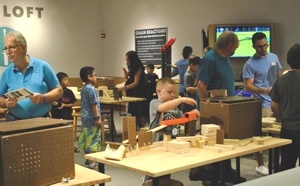 The event will be led by these ASTC Making & Tinkering Spaces in Museums CoP Members from Imagination Station: Carl Nelson, chief scientist, and Sloan Mann, director of STEM education.